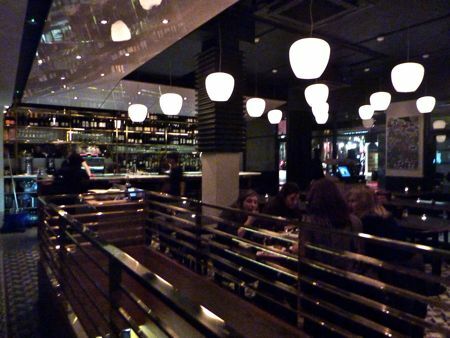 Moro is a great restaurant, but if you want to eat just tapas, you have to sit at the bar. 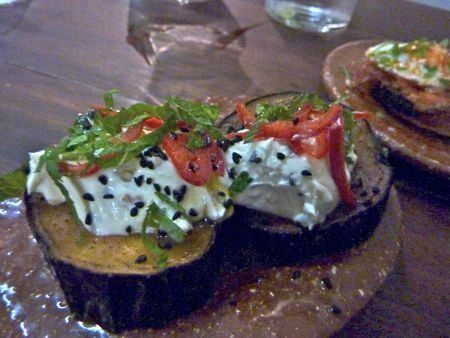 Cue Morito, a small tapas-only sibling next door. 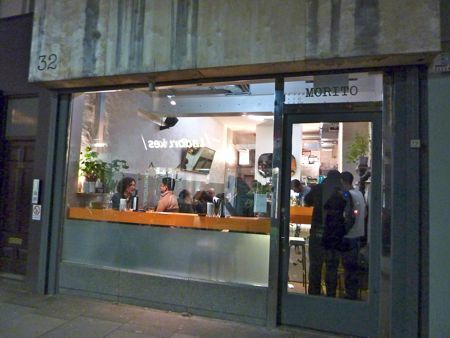 Almost half of Morito is comprised of bar seating (thumbs up for the under-counter bag hooks), and the other half is made up of table seating. It’s casual and buzzy and often crowded. Still, on a recent Monday evening, I was able to snag a table for three, though it was wedged awkwardly in the corner near a waiter’s station. Morito is a lot of fun. 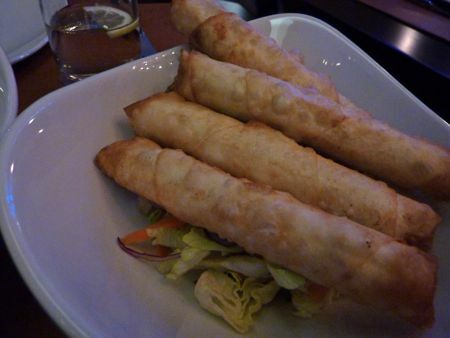 The tapas are small and most are priced under £4 per plate. 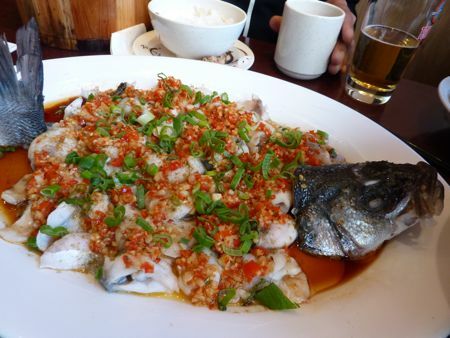 The service was friendly, and most dishes I tried were excellent. The perfect place to have a drink and catch up with a friend. (I wouldn’t go with a bigger group – you’ll never get a table). 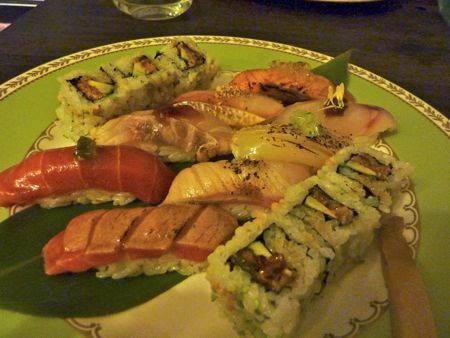 There was an impressively large number of dishes to choose from, and generally, all were pretty good. With cheap and cheerful tumblers of wine, each of us paid £20. And because I still had room for dessert, I treated myself to an affogato down the block at Caravan, which is great on atmosphere, coffee and desserts. 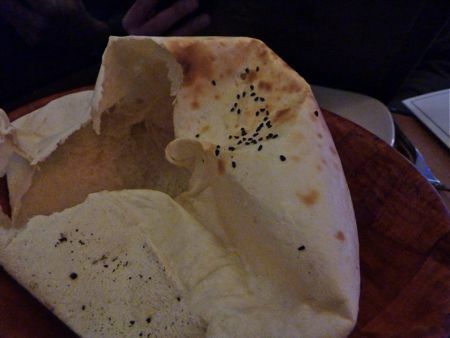 (Dinner there, however, was underwhelming, in case you were wondering). There’s lots of other dishes I wish I’d tried at Morito, including the mussel and chorizo empanadilla, the lamb chops with cumin and paprika, and the spiced lamb with aubergine, yoghurt and pine nuts. So I’ll be back. But only with one friend. 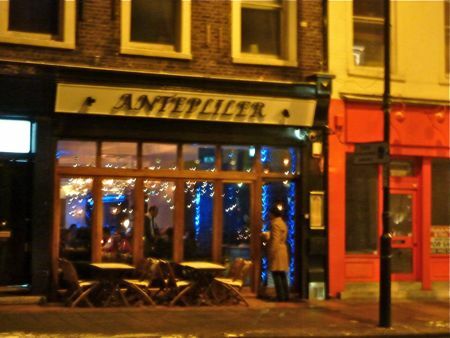 Morito, 32 Exmouth Market, EC1R 4QL; closest tube stations: Angel or Farringdon, but it’s a healthy 10-15 minute walk, so try to catch a bus like the 38. 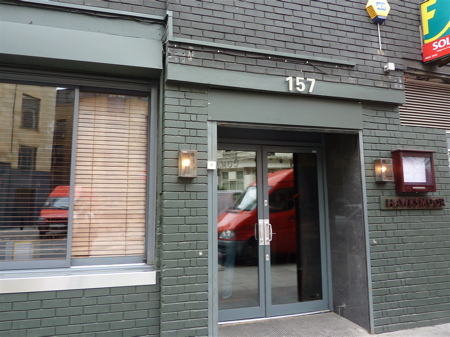 Back in August 2010, I joined omnivorous food bloggers, the Critical Couple, for lunch at the original Hawksmoor steakhouse near Spitalfields Market. 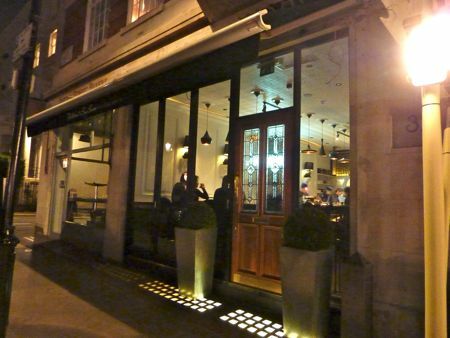 The Critical Couple were not the first food lovers to have sung the praises of the Hawksmoor, and given how close by my office sits, it seemed silly that I hadn’t yet been there. Unfortunately, as the Critical Couple noted at the time in their blog post, the steaks we ordered (a bone-in prime rib for an eye-watering £61 and bone-in sirloin for £29) were disappointing, as was the Hawksmoor’s signature burger (served only at lunch). The two steaks looked beautiful but tasted a bit tough and lacked char. Definitely not what you’d expect at those prices. And the atmosphere at lunch? A bit too spare and utilitarian. I wasn’t sure I’d ever return. (To the Hawksmoor’s credit, the restaurant contacted the Critical Couple after they blogged their review and offered them a free lunch to redeem itself, which it sounds like the Hawksmoor accomplished). Fast forward four months, and Jon tells me he’s craving steak for dinner. Unfortunately, I’ve been temporarily swearing off rare meat. And to go to a place like the Hawksmoor and order a well-done steak is synonymous with flushing money down the toilet, yes? A cow will have died in vain, that’s for sure. So Jon asks the Hawksmoor if they’re willing to serve their lunch-only hamburger at dinner to accommodate me, and you know, they were totally lovely about it. When we showed up for dinner, the room felt completely different from lunchtime. With the lights dimmed and candles burning, the room is warm and inviting. The place is full but not loud, and Jon and I ordered the grilled bone marrow (£6), which arrived silken and smoky with char. 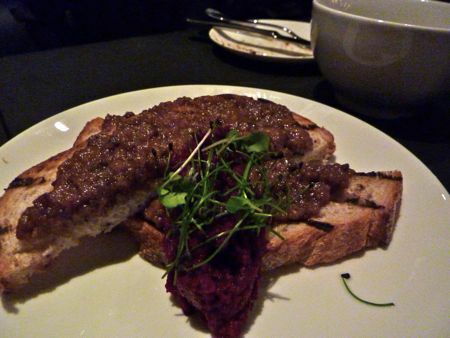 The bone marrow’s accompaniment of sweet grilled shallots complemented the acrid char. More toast (also tasting beautifully of char) was no problem when we asked for it, and although we could easily have shared this starter four ways, I’m glad it was just the two of us. I liked this bone marrow even more than I like St. John’s version, which I think is saying a lot. For starters, because the bone is cut lengthwise, Hawksmoor’s version is easier to eat, but mostly, I loved the mix of acrid and sweet flavors. My cheeseburger was served well-done, and before you raise a hue and cry that I would do such a thing, I will say that if all well-done burgers tasted this tender and flavorful all the time, then I might be willing to order it that way more often. And oh what char! The mayo, cheese, pickles melt into the burger patty, and it’s deliciously messy. 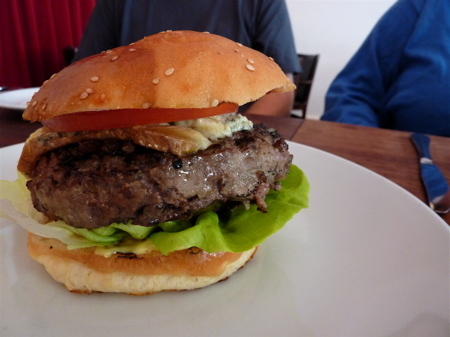 So much better than the prim and proper medium-rare burger I recall from my last visit to the Hawksmoor. 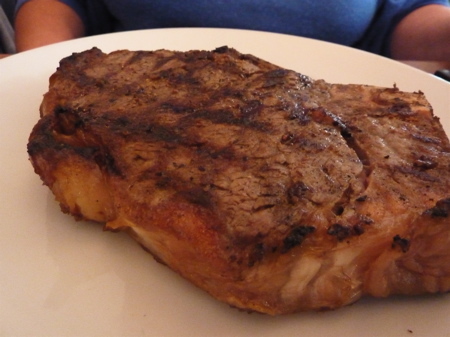 Jon’s medium-rare rib-eye (£26) was very tasty, so he tells me. Service at dinner was friendly and attentive. Tap water refills were fast and furious. 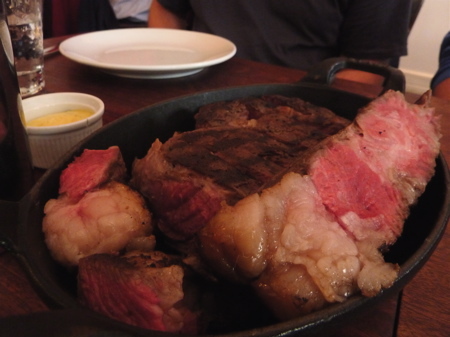 Overall, I had a really nice experience at the Hawksmoor this time around. No question that eating at the Hawksmoor is pricey, with our simple dinner costing us £90 for bone marrow, a burger, a rib-eye steak, two glasses of wine and coffee. What a difference welcoming service, glowing decor and beautifully-blended toppings on a burger can make. I’m still wary of returning to Hawksmoor for lunch because I felt so burned the first time around, but when I’m back to eating rare meat, I’ll look forward to dinner there again. Hawksmoor, 157 Commercial Street, E1 6BJ; 0207 247 7392; closest Tube station: Shoreditch High Street or Liverpool Street Station. 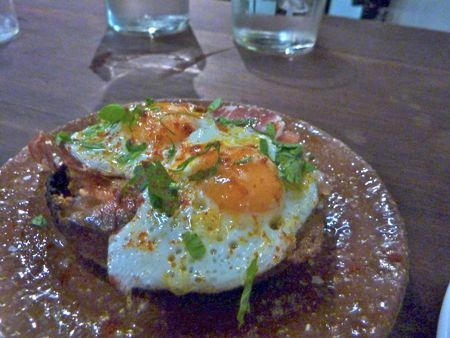 Despite the fact that I have, for several years now, eaten Sunday brunch at the Providores about once a month (Turkish eggs changa with a side of chorizo, I love you), when Peter Gordon’s name comes up, I think immediately of Muzede Changa, a restaurant in Istanbul where Gordon is consulting chef. 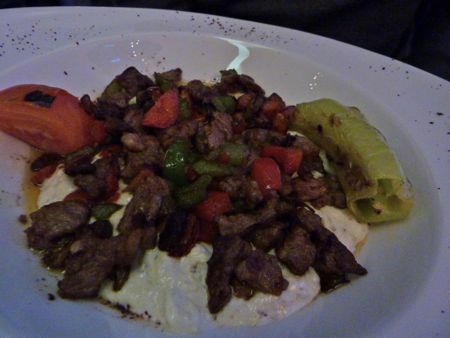 I remember initially being skeptical that a London-based Kiwi chef serving as a consultant to an Istanbul restaurant could result in anything worthwhile, but the food was delicious, and the easy blend of Turkish and other cuisines left me a life-long fan of Peter Gordon’s. Fellow resto bloggers Gourmet Chick and Greedy Diva proposed Gordon’s latest venture, Kopapa, as the meeting spot for our days-before-Christmas catch up, and I didn’t need any persuading. Gourmet Chick’s writeup is here, and I’m pleased to report that Greedy Diva appears to be as big a procrastinator as I am and still hasn’t posted yet about our dinner there! (For an anonymous pro opinion, see the review in this week’s TimeOut). Overall, I liked Kopapa. 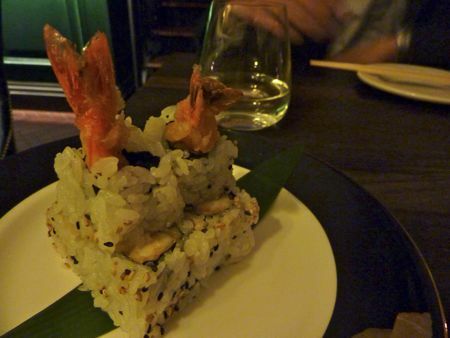 The service was friendly and attentive, and the dining room is casual and welcoming. 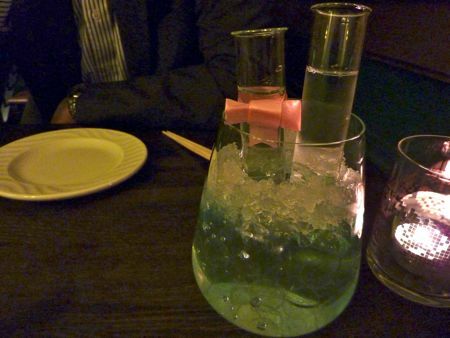 Most of the dishes we tried were good, with just a small minority of forgettable, “skip it” clunkers. For sure, it’d be a great place to drop by for coffee and dessert, and it was a perfect spot for a friendly catch-up. It took the three of us a while to scan the menu, partly because three food bloggers tend to talk a lot about what to order, and partly because the dish descriptions are so long. Also, because most of the dishes are small, you end up having to make a lot more decisions than if you’d just gone with a starter-main-dessert structure. The three of us shared 7 small plates, 1 main, and 2 desserts, and that was just the right amount of food. 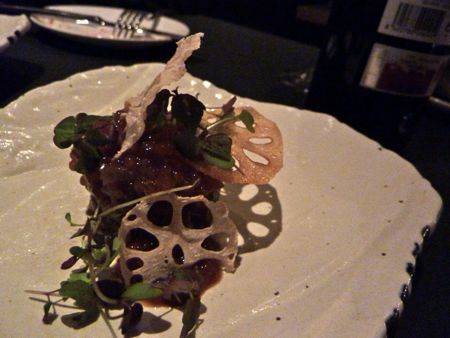 “Sesame infused tuna tartare with soy and wasabi tapioca, crispy lotus root and shiso” – that’s the menu description, and it’s long, yes? 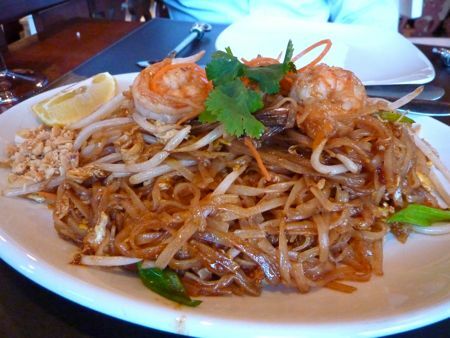 This was the sort of dish that characterized much of what we tried on the Kopapa menu. Boring, safe tuna tartare well prepared with just enough “twist” to lift it out of boring land. Here, we had firm chunks of raw tuna served in a refreshing and well-balanced dressing with nut, citrus and salty flavors. I didn’t taste much heat from the wasabi, but the texture and prettiness of the lotus root was a nice touch. “Indonesian marinated magret duck breast, goats curd, beetroot confit and pickled pineapple” – you have to admire Kopapa for bucking the current fashion of over-simplifying descriptions to the point of unhelpfulness (e.g., a restaurant’s labeling an elaborate salad as just “greens”). But there really is such a thing as TMI. 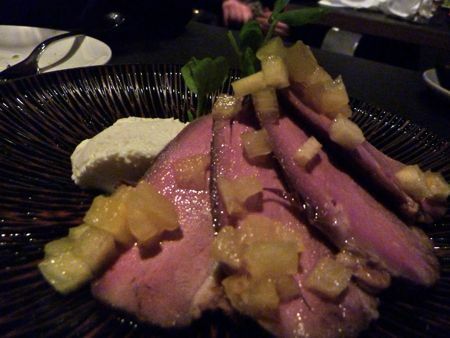 Anyway, similar to the tuna tartare, the rare duck breast was good but boring on its own, however, it was livened up by the sweet-and-sour pickled pineapple and creamy-tangy goats curd. 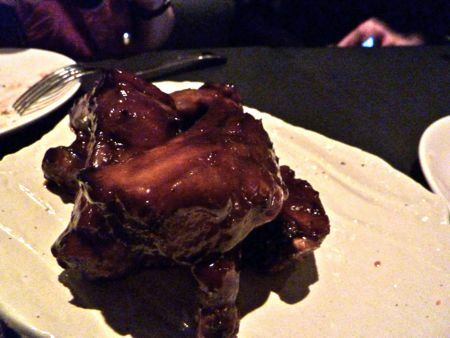 “Coconut sticky pork ribs” were crowd-pleasingly sweet, sticky and fall-off-the-bone tender. 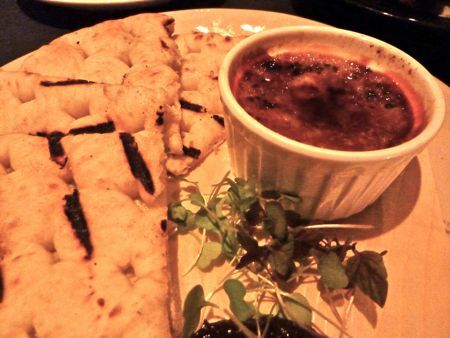 “Grilled duck liver parfait with tamarind raisin chutney and grilled flat bread” — loved that there was no shortage of flatbread to accompany the creamy liver parfait. And the caramelized sugar crust was clever, complementing the liver with its texture and sweetness. “Parmesan and bone marrow on toast with horseradish” – Gourmet Chick noted that this distinguished itself from the bone marrow at St. John, which I agree with, but strangely, was thinking at the time that the flavors brought to mind St. John’s welsh rarebit. 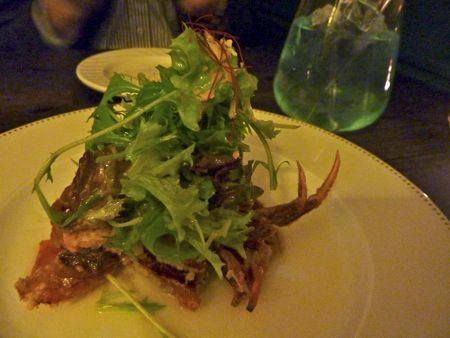 In any case, as you’d expect, this dish was rich and comforting, and I wish there’d been more horseradish. I crave spicy kick, apparently. 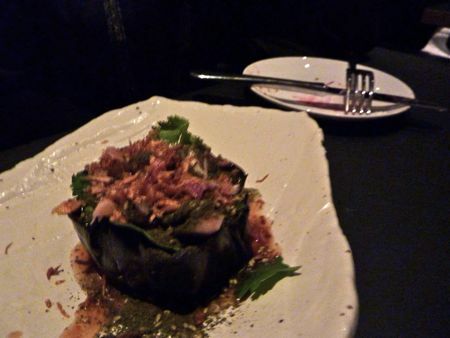 “Grilled aubergine with tamarind caramel, coriander, pickled ginger and za’atar” – I found this whole dish bland despite all the flavor-packed-sounding accompaniments. Normally, I love anything aubergine. 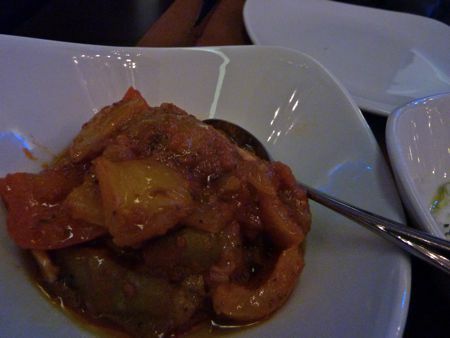 But this dish was just mush with occasional and imbalanced flashes of sweetness and ginger. 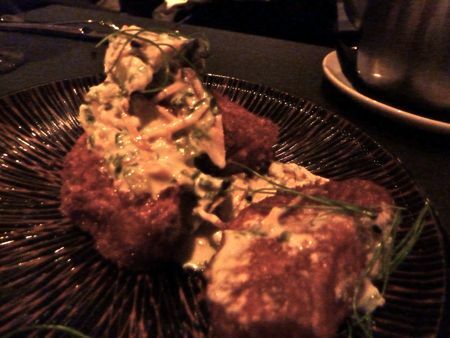 “Five spice and cumin crumbed butternut with coconut cucumber raita” – Breaded and deep fried. I thought it’d be right up my alley. But again, oddly bland and still-too-firm butternut squash. Maybe if the squash had been boiled longer before frying so that it was softer and sweeter? “Cripsy pork belly on almond skordalia and buttered kale with moromi miso & tarragon dressing” – It just tasted like pork belly. 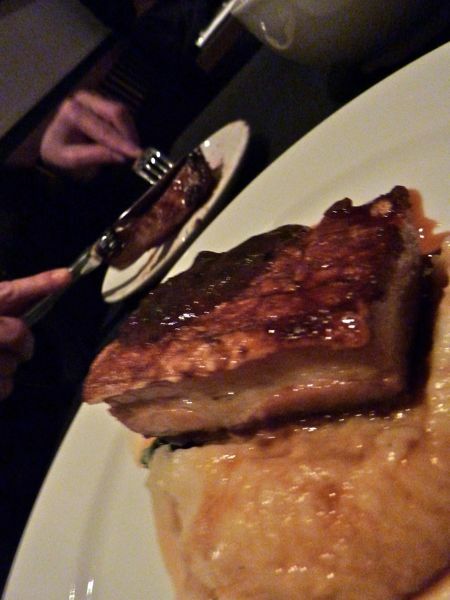 Well-prepared pork belly with a good, shatter-with-a-fork crispy crackling. 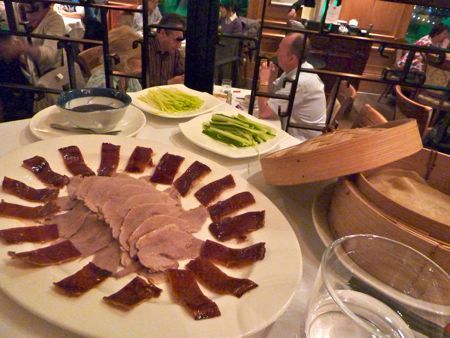 But when you read the menu description, you expect something more spectacular than plain old pork belly. Desserts – simple and delicious. A good ending. 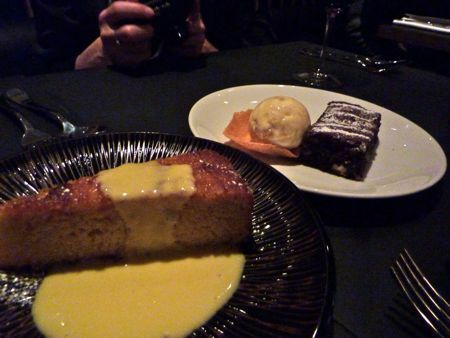 “Boiled-orange and almond cake with passionfruit custard” – we wondered if it was the orange that was boiled, or the whole cake. Gourmet Chick did some digging around and tells me it’s steamed. I’ll go with that. Incredibly moist and infused with citrus, complemented by the tartness of passionfruit. “Double-chocolate and macadamia nut brownie with Golden Crunch ice cream” – sure, it was a lame-sounding choice, but sometimes you just want a brownie with ice cream. And the ice cream with its honeyed crunch was outstanding. Total spend: £109, including service and a modest bottle of wine, meaning we paid £36 each for a generally-tasty, relaxed evening out. I look forward to going back. 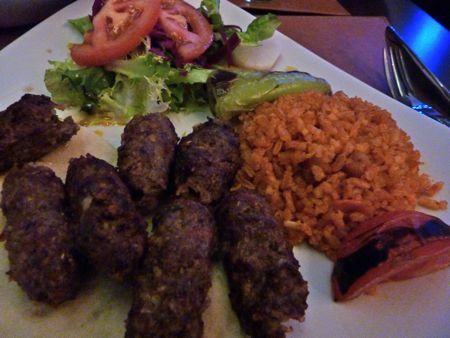 Kopapa Restaurant, 32 – 34 Monmouth Street, Seven Dials, Covent Garden, WC2H 9HA; closest tube stations: Leicester Square or Covent Garden, though I hoofed it over from Tottenham Court Road, and the walk didn’t take much more than 10 minutes.